Canon always offers good products with high quality and comparatively low price to its customers. Canon PIXMA IP4500 is no exception. Pixma IP4500 is a stylish ink-jet photo printer that is highly rated by PC World(83) and CNET(3.5/5) and is recommended to home users who want professional results. Canon Pixma IP4500 features a 5-colour ink system and a 4,608-nozzle print head that ejects precision droplets as small as 1 picoliter. Pixma IP4500 produces amazing results: 9600 x 2400 colour dpi resolution and wonderfully life-life colour values, along with bold, laser-quality text. More amazingly, you can print borderless 4” x 6” lab-quality photos in only 21 seconds. With its two paper trays, you can stop wasting time on paper changing and always be print-ready. 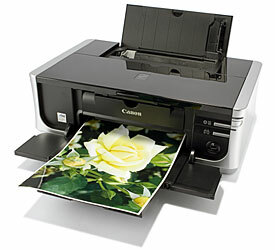 Canon PIXMA IP4500 also features New Auto Image Fix included in the photo print software that produces optimized prints of both portraits and sceneries. It supports varies media type and size, including: Photo Paper, 4″ x 6″, 4″ x 8″, 5″ x 7″, 8″ x 10″, Letter, Legal, U.S. #10 Envelopes, and Photo Stickers. Brand name replacement ink cartridges are very expensive for this model–normally runs over $100 for a complete pack. At 123ink.ca, we offer you one of our best selling compatible ink cartridges – Canon CLI-8 value pack with low price starting from $12.99. The quality is tested by hundreds of our clients. Cli-8 ink cartridge is not only compatible with Canon models like Pixma MP830, Pixma IP4500, but also with Pixma IP3300, Pixma IP5200R, Pixma MP800,etc. ( click here to see more compatible models). When you buy more, we will offer you more discount. For instance, if you buy 3-5 Canon CLI-8BK compatible black ink cartridge(with chip), you could save up to $3.5, if you buy 10 or more, you will save up to $15. In addition, we have Back to School Sale, which will give you 5% off on every order until 30th, September. Check out our website for more information. Don’t let the pricey ink cartridges stop you from having this great printer.